Florence Rasmussen, the old lady that appears halfway through Errol Morris' "Gates of Heaven"
I feel like I should preface this with some sort of spoiler warning. 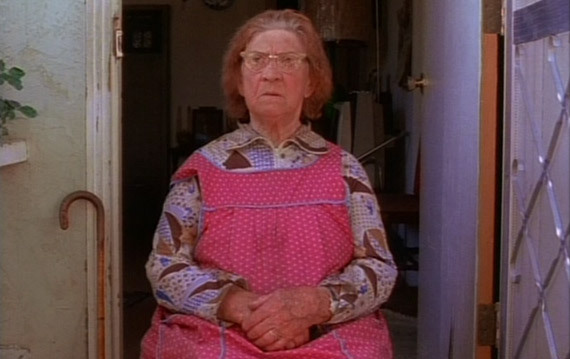 I’m going to talk about a shot in Gates of Heaven, Errol Morris’ documentary (superficially) about pet cemetaries, where an old lady talks meanderingly for a couple of minutes. I’m not going to give any big secret away, but I think it’s most affecting if you don’t anticipate it. Her monologue has almost nothing to do with the rest of the film, but for me the unexpectedness of hearing her speak and the depth of realness conveyed in her scene is the essence of what makes documentary filmmaking great. I don’t really know how that reads, but when it came in the middle of the film I was knocked out. It’s like a brilliant photograph that lasts two minutes, a snapshot that captures events beyond what’s immediately visible. It’s all those things that writers struggle to convey: it’s universal, surprising, sad and happy, funny and poignant. And despite being so out of place that it’s jarring, the scene somehow fits perfectly at the same time, evoking the same type of pathos that runs throughout the rest of the film, with it’s pet owners griefstricken at the loss of their dogs. This is why I love documentaries. A great one can ostensibly be an investigation of a subject, a simple storytelling, but then gradually reveal itself to be about something much different, something much more important. A great documentary will stay with me for days the way no film can, and I won’t shut up telling anyone who will listen to me all about it. Watching something that scratches away at the surface of the ordinary is to realise how fake so many actors and dramatic writers are. Watching someone like Florence living out her story, abstracted on screen yet somehow brilliantly illuminated just by having a camera pointed at her, hammers the point home.